How would you build the ultimate sleeper? Sleepers come in many forms, from well disguised muscle cars to monsters in economy car clothing. After witnessing the insanity of the 728 horsepower Camry we started thinking about the variety of different options when it comes to creating a sleeper. This weekend we want to know about your ideal vision of a seriously fast car that looks like anything but. How would you build the ultimate sleeper? I featured what I consider to be the perfect sleeper in American muscle car form last month, so I'm going to take the German car direction on this. 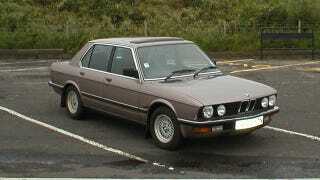 I would start with a full euro spec 1987 BMW 520i (think above picture but White). Keeping interior and exterior completely stock (maybe add some 16" BMW basketweave wheels), I would somehow stuff a supercharged ZR1 engine underneath the hood. This is a hypothetical, so the highly talented custom shop I employ to construct it could worry about the nightmare logistics of this swap. Behind the LS9 would be the same 6 speed Tremec manual transmission found in the new Corvette. Super creative? Not Really. Reliable and fast enough to embarrass most muscle cars in an old four door BMW? Absolutely.